The blanket wrap and poncho trend is currently back on the High Street. I had a poncho years ago, early 2000's, it was a grey knit with tassels and I loved it. But it had its time and ended up as another item of clothing you couldn't be seen in......until now. 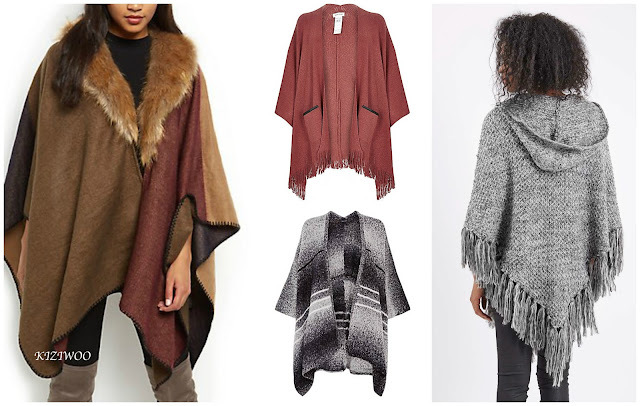 Blanket Wraps and Poncho's have made a massive comeback this year and again I'm in love with them. Today I wanted to show you four I'm currently lusting over, and yes I've yet to decide which one or two to purchase. First up is the New Look Tan Contrast Blanket Wrap (Large image on the left) and I think this is my favourite. This has a extremely soft faux fur trim and the colours are perfect for this time of year. The only downside to this is it's handwash only due to the faux fur trim. Next up is the Black Ombre Blanket Wrap, also from New Look (middle bottom image). Being black it can be worn over any colour clothes and look fabulous. Again the fabric is super soft and also machine washable. Above this is the River Island Rust Brown Cape and isn't the colour amazing! The River Island cape is a fine knit with two leather look trimmed pockets. Stylish yet simple in design. And last but not least is the Top Shop Hooded Poncho. To me this has a real boho vibes about it; the tassels and the hood makes this more casual to wear unlike the others that can be dressed up or down. For me grey is always a winner and can be teamed with every colour in the wardrobe. Ooooh, I like the one with the hood!